Scroll down to see photos and 30th anniversary video! The day dawned crisp and sunny and the mood only climbed higher as the 30th anniversary of ONA in Massachusetts was celebrated on November 8. 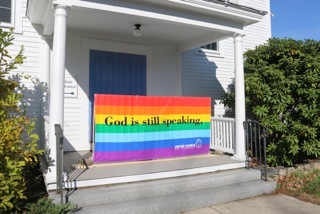 The beautiful UCC Congregational in Boxborough hosted the event called “Never Turning Back.” The congregation was so accommodating, the space lovely and welcoming, and the sanctuary decorated with differently colored fabrics in its brass sconces. The warm-up was cabaret tunes by singer and pianist, the Rev. Kent French and Tim Harbold. Then The ONA Turning 30 Band lifted the congregation into the first worship service. The other members of the ONA Turning 30 Band were music director Willie Sordillo (also saxophone), Zoë Krohne (vocals), Michael Molla (drums), and Doug Rich (bass). 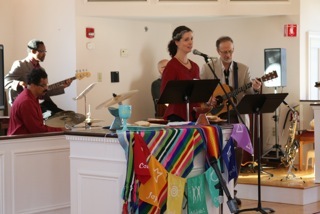 Zoë led the congregation in the opening song, "Never Turning Back" - the theme for the day. The Rev. 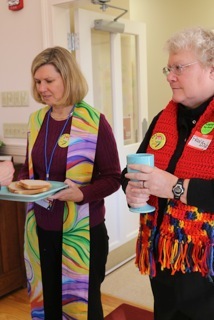 Katrina Clinton and Jo-Ellen Fisher created lovely ONA 30th anniversary stoles, paraments and a processional banner. The design symbolizes the seed of ONA in 1984 and the beautiful tree into which the ministry has grown. The Just Peace Players presented a preview of their new play celebrating 30 years of ONA as the call to worship. A beautiful litany honored the founders and contributors to the ONA movement over the years. 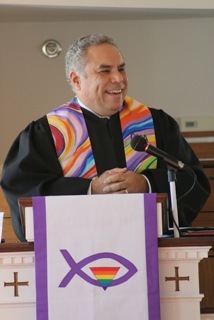 Attendees were welcomed by the Rev. 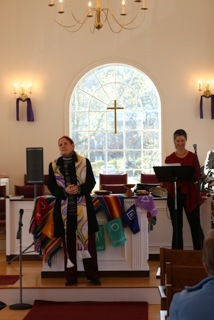 Cindy Worthington-Berry, pastor of the Boxborough Church. Andy Lang, Executive Director of the Open and Affirming Coalition sent video greetings and thanks to the MA Conference for its leadership in the formation of the ONA movement and in its growth since 1984. We were blessed by our two preachers. The Rev. Ann B. Day brought the message that in the ONA movement, we are all “Sarahs and Abrahams,” setting out toward our goal with courage and hope, not knowing what to expect. In telling her personal journey, she entertained, as usual, and challenged our thinking. In the afternoon worship, the Rev. Felix Carrion shared his perspectives and examples of inclusion, intersectionality and the personal meaning of ONA for his family. Music was the glue that carried the spirit of the worship services and the band was phenomenal. Featured songs included "Singing for Our Lives" (the Holly Near classic), "Sweet Justice Seekers" (words by Fran Bogle and sung to the tune "Sing Low, Sweet Chariot"), "Draw the Circle Wide", a lovely original by Willie Sordillo called "Child of God" (performed by the band), "Everything Possible" by Fred Small, and "For Everyone Born". Before and after lunch, there was a period of breakout conversations. Lively and meaningful discussions focused on these topics: LGBTQ asylum, radical welcome in two churches, interfaith work for LGBTQ, transgender and non-binary identities, ONA and Latin@ communities, Just Peace Players, LGBTQ youth - tomorrow’s leaders, anti-racism/homophobia/intersectionality in the church, and an ONA new church start. There was also a marketplace information by several of the presenters of these topics and the MA Conference ONA Ministry Team. We welcomed and recognized several important guests. Donna Enberg served with her wife, the Rev. Ann B. Day (former National ONA Program Coordinator) as ONA staff person for 20 years until 2007. Donna and Ann created structure, systems and resources for the ONA program. We also welcomed Olivia Masih White, who was chair of the Resolutions Committee at the UCC’s General Synod in 1985. She was instrumental in coordinating and shepherding the national ONA resolution adopted by Synod that year. The Rev. Dr. Ken Orth was acknowledged for being one of the original contributors to the ONA study materials as a member of the MA Conference ONA Task Force. A sampling of ONA 30th celebration photos. View more on our Facebook page (no account needed).